The fruit is picked by hand at the peak of ripeness, then crushed, fermented in oak barrels, and aged for three years before being bottled. The final product is a distinctive shade of red, and is served in fine restaurants all around the world. But it’s not Cabernet, Merlot, or Burgundy. It’s Tabasco® Sauce, the world’s most famous red pepper condiment. It has been bottled on Avery Island, Louisiana by the McIlhenny family since 1868. And this little bottle is full of interesting stories. Avery Island is located 140 miles (225km) west of New Orleans. The term “island” is a bit misleading, as it’s not surrounded by water so much as marshland. This 2,200-acre (900-hectare) mound of solid ground was originally called Petite Anse, and part of it had been inherited by a Baton Rouge judge named Daniel Avery. When Avery eventually purchased the rest of the property for his family, it was renamed Avery Island. Avery Island is in fact a huge mound of salt, and for many years salt mining on the island provided a significant source of income for the family. A banker named Edmund McIlhenny had married Avery’s daughter Mary in 1859 and settled on the island. At some point he met a man on the street who gave him some red peppers, claiming he had obtained them in Mexico. McIlhenny liked them, and planted some of the seeds to grow his own pepper plants. Not long thereafter, though, the Avery and McIlhenny families were forced to move to Texas when their salt operation became a strategic target during the American Civil War. Following the war, in 1866, McIlhenny returned to the island. Although much had been destroyed during the war, his pepper plants remained intact. He decided to experiment with them and see if he could come up with a hot sauce recipe he liked. The peppers were a variety of Capsicum frutescens, originally from Panama but cultivated commercially in the Mexican state of Tabasco (and thus referred to as Tabasco peppers). McIlhenny eventually came upon a simple formula: pick the peppers at their very peak of redness, then crush them immediately and add Avery Island salt. The resulting mash was left to ferment, and after sufficient time had passed, it was blended with vinegar, strained, and bottled. McIlhenny originally used cologne bottles because they were the right size and had sprinkler tops that would allow the sauce to be shaken out one drop at a time. He called his product Petite Anse Sauce, but when the family complained, he renamed it Tabasco Sauce. McIlhenny produced just 350 bottles of his sauce in 1868; today, the company he founded produces three quarters of a million bottles each day. The McIlhenny Company likes to maintain the illusion that its sauce is made entirely on Avery Island—and it was, until the 1970s. But nowadays, 98% of the peppers used for Tabasco sauce are actually grown in Honduras, Venezuela, Mexico, and Columbia, though the seeds for these plants all come from peppers grown on Avery Island. The reason, of course, is cheaper labor—there is no automated way to pick the peppers, because they do not all ripen at the same time. The peppers are made into mash (using Avery Island salt, the company claims) the day they’re picked; the aging and the rest of the production process takes place on Avery Island. 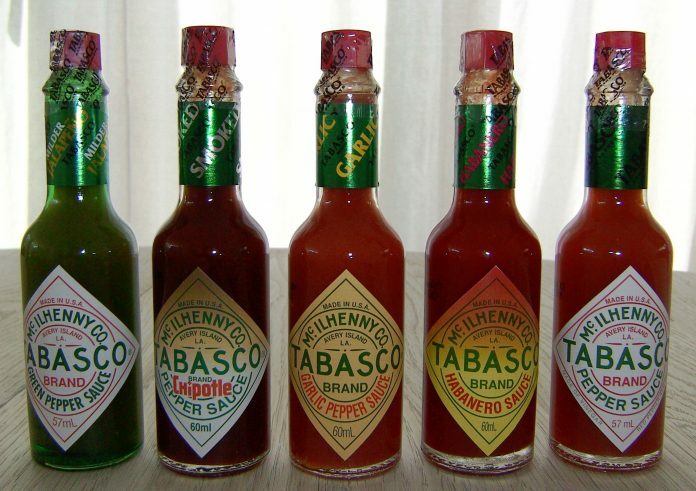 McIlhenny was careful to trademark the name Tabasco. As a result, even if your last name is Tabasco and you produce a sauce containing Tabasco peppers grown in Tabasco, Mexico, you cannot legally use the word “Tabasco” in your product’s name. For many decades, Tabasco was the only pepper sauce in widespread commercial production in the United States; today, there are well over 1,000 brands. Within that range, Tabasco is not especially hot. On the Scoville scale of chile hotness (a measurement of the level of capsaicin, the compound that gives peppers their bite), the original version of Tabasco sauce tops out at about 5,000 heat units, and even the hottest variety of Tabasco sauce rates only about 8,000. For comparison, Cayenne scores about 50,000; a Habañero can go as high as 350,000; and police-grade pepper spray is about 5,000,000. None of this, of course, diminishes Tabasco’s popularity, and even with a Scoville score three orders of magnitude smaller than pepper spray, I am reliably informed that you do not want to get it in your eyes. Note: This is an updated version of an article that originally appeared on Interesting Thing of the Day on October 18, 2003, and again in a slightly revised form on September 9, 2004.